It was Seneca The Younger, or Oprah, who once said, ‘Luck is preparation meeting opportunity’. If that’s truly the case and not simply wishful superstition, then somewhere along the way the Pinbone crew nailed their cosmic mise en place. Chefs Gemma Whiteman and Mike Eggert have always been ones to make their own luck though. 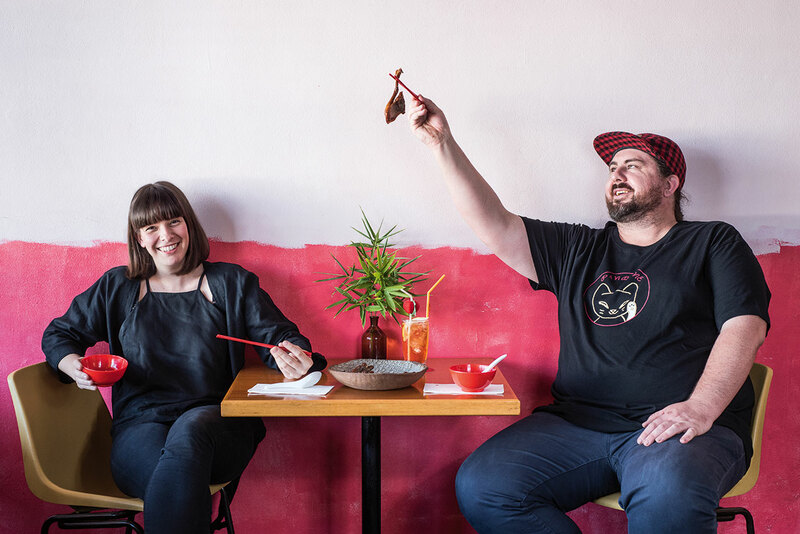 The pair met two and a half years into Whiteman’s five-year stint at Billy Kwong, where they worked alongside a coterie of “superstars” whose work, like their own, is fast coming to define Sydney dining. In addition to being an all-star proving ground, chef Kylie Kwong’s kitchen was also something of a crucible – one in which they forged the skills to do everything they love (and would soon build a name on) by knife or by hand alone. But after five years spent in a wilderness of short-lived residencies and following a beloved first iteration of Pinbone, it was an episode of No Reservations, chef Anthony Bourdain’s culinary travelogue set in Mongolia, that would reignite a shared yearning to cook over a wok and ultimately usher in a brave – and potentially foolhardy – new era hinging on the symmetry between beautiful produce and “a melting pot of Asian styles, Chinese and Japanese in essence”. Two days later, the universe would offer another sign: one advertising a prospective short term lease on a moribund neighbourhood Japanese restaurant in Kensington, the dining room crowned with an Imperial gazebo painted a lucky shade of red. On the day they closed the deal, they unearthed a horseshoe in the back of the bamboo-fringed backyard. “It gave us a sense of fearlessness and the confidence to be able to make anything work,” Eggert says of their peripatetic pop-up years. “It was really risky to come here. We thought, ‘we’re really going into the lion’s den. Three white people opening a Chinese restaurant and charging more? We are really going to need some luck to pull this off.’” Sure enough, a name announced itself and Good Luck Pinbone was born. They needn’t have worried, it turns out. A community – of locals, epicureans and contemporaries alike – has embraced their singular cuisine with gusto. Some customers have even taken to gifting them with charms on return visits. They’ve received a gold chicken wishbone, as well as a lucky cat, pig and peanut. Should you too decide to try your luck, Eggert has just one request.